[Solved] How to Download Convert Spotify to MP3 for Offline Listening? [Solved] How to Free Download/Convert Spotify to MP3 for Offline Listening? Spotify to MP3: Is it possible to free download and convert Spotify music to MP3 for offline enjoying with no limits? As one of the most popular online music streaming sites, Spotify offers over 30 million songs for users to listen online. But only online music playing is not enough, many people are trying to figure out an efficient way to free download or convert Spotify to MP3, so as to listen to favorite Spotify music offline whenever and wherever they want. Are there some ways to free download & convert Spotify music to MP3 for offline playback? You come to the right place. This tutorial will provide you best answers of Spotify to MP3 problems and the ultimate solution to save Spotify songs to MP3 files by means of a professional Spotify to MP3 converter and downloader. Before starting to free download/convert Spotify to MP3, here are some facts about Spotify you need to know. Q 1: What are Spotify supported audio formats? A: Spotify use Ogg Vorbis audio to stream music, rather than MP3. But it appears to be in Ogg only on the desktop, in Web Player, it appears to be in MP3. As for local music, Spotify supports .mp3, .mp4, and .m4p audio files but it doesn't support .mp4 files that contain video. If QuickTime is installed on your computer, then .m4a files are also supported. Q 2: Who can download Spotify to MP3 for offline playing? Spotify Free: Listen to Spotify music online for free but with ads. Can't download Spotify songs, not mention to download Spotify music to MP3. Spotify Premium Account: Monthly Fee: $9.99, £9.99, AU$11.99, etc. In the UK and Germany, students can receive a 50% discount on their subscription fees through UNiDAYS or with a valid NUS Extra Card. By upgrading to Premium, you can enjoy downloading Spotify music for listening offline, enhanced sound quality, no ads interruptions and sharing songs or playlists with friends and families. Q 3: How to download and play Spotify music offline? Note: The downloaded Spotify music may only be accessed with Spotify apps, the Web Player website, or other apps authorized by Spotify. If you'd like to play Spotify songs on other devices, you may need to convert Spotify to MP3 or other audio files. [Solved] How to Convert Spotify to MP3? According to users' practice and what stated above, we can conclude that users cannot directly download Spotify to MP3, but they can use the record option to download/convert Spotify music to MP3 or find other alternatives to free download Spotify music for offline listening. Below we provide you some solutions. 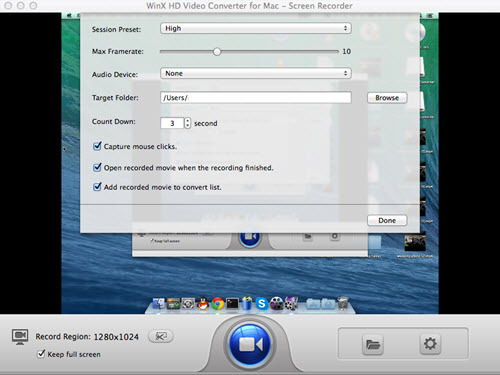 Free download, install and run WinX HD Video Converter for Mac on your Mac computer. Step 1: Click "Screen Recorder" to step into the recorder interface of the Spotify to MP3 converter. Step 2: Adjust the capture settings, such as audio device, target folder, record region, etc. Please make sure there's no other sound around and stable network connection during the whole recording process, otherwise, there will be accompanying noise. Step 3: All settled, you can press "Start" button to begin to download/record Spotify music. The recorded video will be auto added to the convert list and you can convert your Spotify music video to MP3 or directly to iPod, iPhone, iPad, Android, etc. by selecting different output profiles. Since we have found out that Spotify is a streaming music service and there is no way to download Spotify music to MP3 directly. 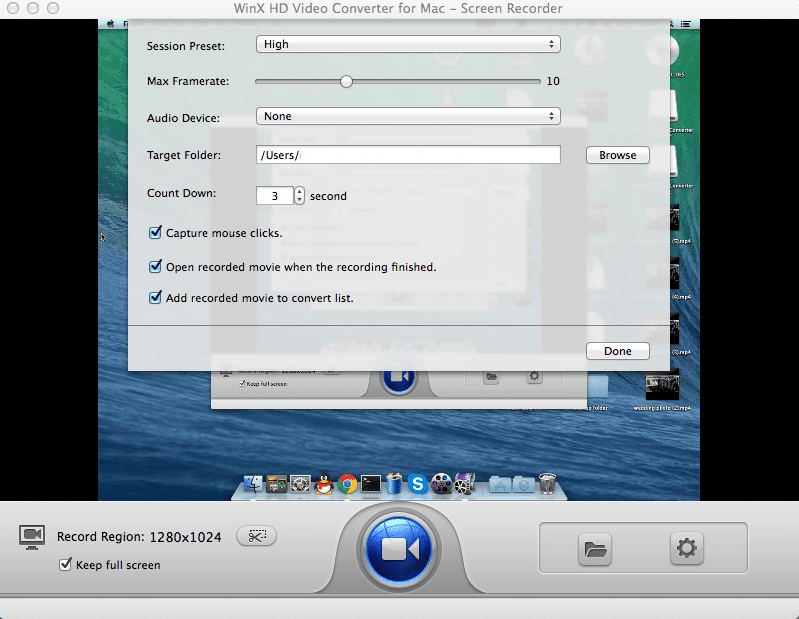 Here is an efficient alternative, WinX HD Video Converter Deluxe/for Mac. Just like said above, it is also a music downloader/converter, enabling you to free download any music videos/MP3 songs from YouTube, Vevo, SoundCloud and 300+ sites in 3 simple steps (Copy and paste URL, analyze, and start download) and also convert any video to MP3, AAC, AC3, iPhone Ringtone, etc. You can use it to free download favorite Spotify songs from YouTube and alike sites with no hassle. 2. You can also download its trial version with no penny, and its download function is totally free enabling you to free download any 8K/4K/HD/SD videos/movies/music from YouTube, Dailymotion, Vevo and 300+ sites with original quality. The limit of the trial version is it only allows you to convert 5 minutes video. Anyway, the music video/MP3 song is always less than 5 minutes, and you can easily use it to convert any music video to MP3 for free. 3. WinX HD Video Converter Deluxe can also help you to convert any 8K/4K/HD/SD videos to MP4, AVI, WMV, MOV, iPhone X/8/7, iPad, Android and many more. It is 100% clean and safe. If you need to convert (Spotify) music to MP3 for iPhone X/8/7/6S/6/Plus, iPad Pro, iPod, Samsung Galaxy S8/S7 (Edge), etc. please turn to WinX HD Video Converter Deluxe.